This essay first appeared on Chen Xiaowei's blog. It is also being published in his forthcoming book of essays titled 《好书之徒》(which can be translated as The Dude of Fine Books) published by 中华书局. The way I see it, 2010 is “The Year of Chang Ch'ung-ho.” First, I bought two new books published in mainland China: The Literary Traces of a Musician (written by Kang-i Sun Chang) and Chang Ch'ung-ho: Selected Poetry, Calligraphy and Painting (written by Bai Qianshen). Last week, I went to the Xiling auction in Hangzhou, which turned out to be pretty lively. The spring auction contained a batch of painting and calligraphy collected by Chang Ch'ung-ho; a dozen pieces of un-mounted, long, vertical scrolls of calligraphy by Shen Congwen (沈从文, 1902–1988); a horizontal scroll by Shen Yinmo (沈尹默, 1883–1971) of his own poetry; and random pieces by Yu Pingbo (俞平伯, 1900–1990), Qian Mu (钱穆, 1895–1990) and others. Finally, there was a work on silk of Chang Ch'ung-ho's xiaokai calligraphy titled Five Poems on the Subject of the Phoenix on Shen Congwen's tomb, to the tune of Wang Jiangnan. There was a huge crowd of bidders for this batch of works by distinguished people and from an old collection—as expected all auction items sold for very high prices. Someone next to me whispered: “The bidding price is so high that we will never have chance to recoup our investment.” However, we were determined to forge ahead regardless, even if there was no hope of ever breaking even. Chang Ch'ung-ho, the free spirit, would have never dreamed how she was making it possible for us mere mortals to have a raucous feast in her name. The unusual now becomes the usual. Through ceaseless wind and snow, we come and go. whether our journey is short or long. The thundering wheels roll. But why such haste? Clouds and mountains move backward. Why? both grasp at the evening sun. In the meantime, I acquired a copy of Peach Blossom Fish, a book of Chang Ch'ung-ho's poetry published in the United States in 1999. Chang Ch'ung-ho has repeatedly said that this is her most satisfying book. It contains 18 poems she selected herself, so it can be understood as her selected poems. The title Peach Blossom Fish is taken from two poems in the book written to the tune of “Lin Jiangxian.” Actual peach blossom fish are a type of freshwater jellyfish (Craspedacusta sp. ), that appear in large numbers in the rivers near Chongqing in the spring, and legend has it that they are attendants to actual peach blossoms. This is because when peach blossoms fall upon the surface of the water, these jellyfish appear. And, when the flowers finish falling, the jellyfish disappear without a trace. So this jellyfish is often used as a symbol of love. The book was designed and produced by the American painter, bookmaker and artist Ian Boyden. His name in Chinese is Bo Ying (薄英). Peach Blossom Fish is a simple and honest, well-played work of art. It is not in the least ostentatious as are typical luxury volumes; rather it is book defined by naturalness, just as the moon is white and the wind is clear. After I received the book, I wrote to Boyden and over the course of several letters he relayed to me various anecdotes regarding publishing this book. I will begin with some background regarding the book's origin. In 1990, Ian Boyden attended Nanjing University (Nanjing University is also my alma mater) to study Chinese and history. At that time he was just a young man, only 19 years old. During his time there he began to study calligraphy and held a two-day solo exhibition of calligraphy at the Drum Tower. In addition to calligraphy, he also learned to cook Chinese food in a local restaurant, his specialty being General Pao's Chicken. In 1995, he came to China again, this time to study with Professor Hua Rende at Suzhou University. During this year, under Hua's direction, Boyden studied calligraphy, epigraphy, and traveled extensively to look for ancient inscriptions. In 1998, he received an MA from Yale University. At this time, he had been immersed in academic research for many years. However, Boyden realized that he was an artist at heart. He listened to this calling and became a painter and maker of books. In 1998, he founded Crab Quill Press, a sole proprietorship dedicated to producing fine-press artist books. Ian Boyden and Chang Ch'ung-ho met each other 1993 or 1994 when Ian Boyden asked Chang Ch'ung-ho if he could be her student. They soon became friends and Boyden often traveled to her home to study with her. In particular, he studied the calligraphy on epitaphs of the Six Dynasties as well as the Shi Chen Stele. Boyden founded Crab Quill Press with the mission of producing books related to calligraphy and poetry. His first thought was to approach Chang Ch'ung-ho. He approached her with the idea of making a book together of her poetry and calligraphy, and she immediately agreed. So Boyden flew to her home in Connecticut and spent several weeks translating her poetry. Ian Boyden put a great deal of thought into the production of this book. The first job was selecting the poems. After they selected poems, Chang Ch'ung-ho's husband, Hans H. Frankel, and Ian Boyden worked closely together to translate the poems. Hans H. Frankel was the head of the Department of East Asian Language and Literature at Yale University for many years and possessed a very deep knowledge of Chinese and Western literature, so the work of translation came naturally to him. And, when they experienced difficulty in the translation, they were able to seek clarification from the poet herself. During the translation process they decided on the book's title Peach Blossom Fish. Once the text itself was complete, Ian then set the text in lead type and printed a complete set of the poems in English. This allowed him to determine the minimum dimensions of the book. Boyden sketched out several layouts and presented them to Chang Ch'ung-ho, and after discussion they decided on the final layout. Chang Ch'ung-ho then followed these dimensions and wrote out her poems in a type of calligraphy called xiaokai, or small standard script. 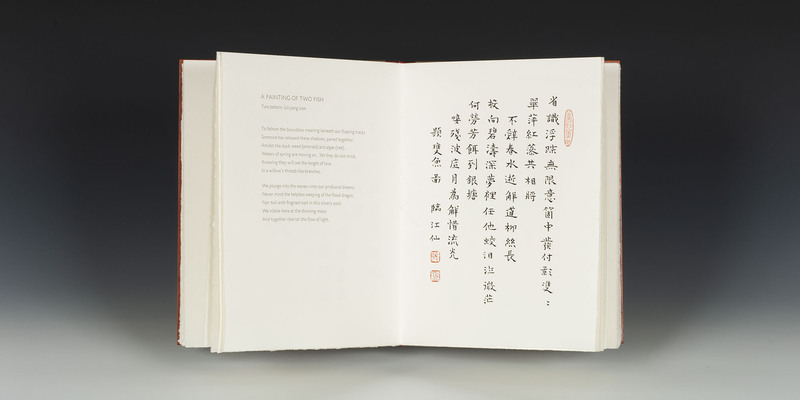 Bai Qianshen, of Boston University, carved a seal specifically for the cover of this book. Grass sandals tread with ease on cinnabar steps. Are not in the habit of flying. From somewhere comes the faint sound of an axe. But found no tracks in such a wilderness. The twists of a stream, I returned. Once this work was finished the rest of the production fell on Boyden's shoulders. First he needed to find a paper that would fit with the unique beauty of Chinese calligraphy. He chose a fine-art paper made by the German company Hahnehühle. Since its establishment in 1584, Hahnemühle has enjoyed a high reputation in the West for its fine art paper. 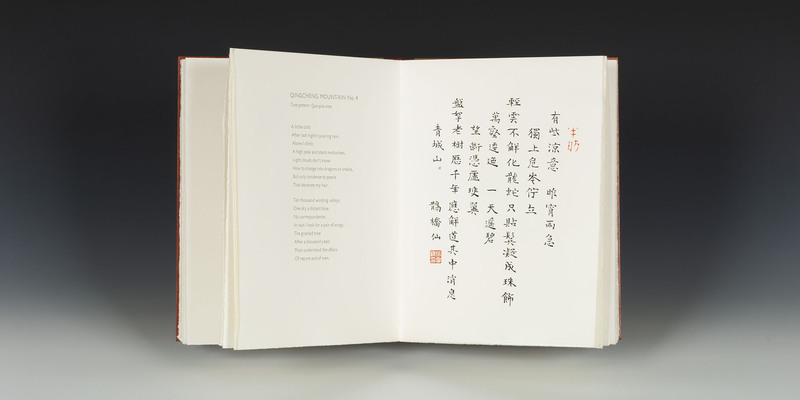 Once the paper was selected, Chang Ch'ung-ho's calligraphy was transferred to printing plates. But when Boyden went to begin printing the book, he discovered that he had made a terrible error: the printing press that he was to use was too small. Because this printing press was too small, he could not print the folios he had envisioned. He had no choice: he had to find a larger press. He spent a about a month in search of a new press. Ultimately he found a Vandercook SP20 hand-operated letterpress, which he then spent several weeks reconstructing so that it would be in perfect running condition. This machine, although old, is considered to be one of the great letterpress machines. Because it is hand-operated, after the first day's work, Boyden suffered considerable pain in his right arm and shoulder. While he was waiting for his press, he began to study the type of ink he would use to print Peach Blossom Fish. He began to develop his own ink specially for the book, repeatedly testing it over the course of several weeks, hoping to find an ink that was as black as Chinese ink, while avoiding the formation of smudges that can occur in letterpress printing when too much ink is on the press. He did this so as to maximize the quality of the reproduction of the calligraphy in Peach Blossom Fish. 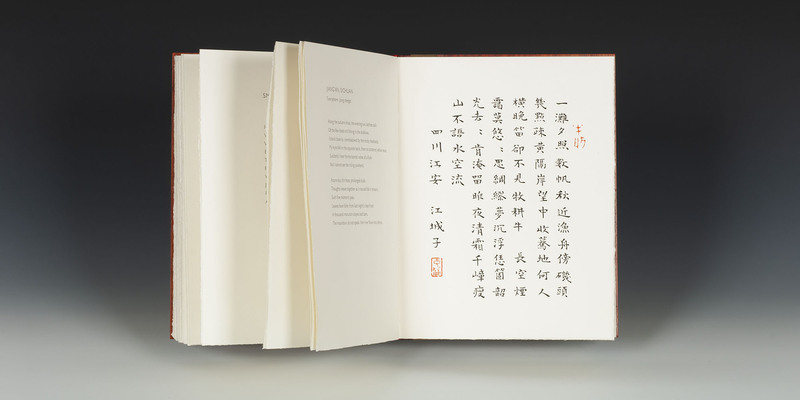 The selection of a Roman typeface to pair with Chang Ch'ung-ho's calligraphy turned out to be no easy task. This font could not compete with her calligraphy, rather it needed to be delicate, subtle, limpid as autumn water—something that would complement the aesthetics of her calligraphy. Ultimately, Boyden, selected Gill Sans Light, a typeface designed by Eric Gill who was also a famous twentieth century English sculptor. Ian Boyden contacted Michael Bixler who still had original mats for casting these letterforms and hired him to cast the entire manuscript for him. Michael Bixler is one of few remaining people casting lead type in the United States. Each page of Peach Blossom Fish was actually run through the press three times: once to print the calligraphy; once to print the English translations; and once to print the seals. This is also one of the reasons that handmade books are so laborious. This book appears in a print run of one hundred and forty copies. Ian Boyden started production of Peach Blossom Fish in 1999 and finished binding the last copy in 2002. Chang Ch'ung-ho has a seal that reads “All my life I have loved naturalness.” The love of nature, and the sense of intimacy with the rustic qualities of people and things—these two characteristics form cornerstone of the friendship between Ian Boyden and Chang Ch'ung-ho. Ian Boyden placed his love of natural materials into Peach Blossom Fish. The covers of this book are of wood. Boyden used three different types of wood to bind the book: padauk, Alaskan yellow cedar, and sapele. Ian Boyden first became interested in wood when he house sat for the famous violin maker Paul Schubach. Paul Schubach's house was filled with a variety of beautiful woods. One day, Schubach picked up one of these boards, and, holding it next to his ear, knocked on it with his knuckle and listened to its sound. Wood that is to be used in making violins will ring sweetly. If the board issued a dull sound, Schubach would put it aside. Ian became fascinated with the beautiful patterns and the natural aroma of these woods. He began to ponder the relationship between books and musical instruments, and he felt that the book can be understood as a musical instrument, a kind of instrument for playing language. It turns out that there is also an ancient link between wood and the book. In fact, the etymology of the English word “book” derives from the old Germanic word meaning “beech tree.” Ancient European text were engraved in panels of beech wood, which form the prototype of the Western books. The Chinese used bamboo, the ancient Egyptians used papyrus, the ancestors of all races invariably talk to the plants for their piety and joy. And later in Europe wood was for book covers, which were then wrapped a layer of leather. Today, people tend to have forgotten this simple and intimate relationship between trees and books. Ian Boyden told Paul Schubach that he wanted to make a book with a wooden cover, and he asked if Schubach would give him a piece of wood that would be suitable. Schubach was delighted by this question and proceeded to teach Boyden about the names and origin of different woods, the nature of different woods, their grain patterns, how they should be cut. If you cut a piece of wood in the wrong way it will affect the stability of the wood and it will warp. Under Schubach's direction, Boyden entered into the strange world of wood. If Peach Blossom Fish is a violin, it is played by Chang Ch'ung-ho, each note reverberating with her calligraphy and poetry. What kind of wood would Ian Boyden choose for such an elegant East Asian poetry? His first thought was to choose Chinese woods such as red sandalwood, or fragrant rosewood, but both were expensive and further it was impossible to find pieces that were of a good quality. He ended up choosing padauk which is a close relative to red sandalwood, and is very dense with beautiful red and brown stripes. Amusingly, this wood contains a strong dye. One evening, after Ian had spent the day sanding the covers of the book he returned home covered in padauk dust. He threw his clothes in the washing machine along with the rest of the family's clothes. All of the clothes in the washing machine turned pink. Ian still has a pair of pink socks from that wash that he wears on special occasions. African sapele wood is slightly softer than paduak, but its stability is excellent, and there was a sufficient supply in the market. It is often used to make the back and sides of violins and acoustic guitars. This wood displays a great deal of chatoyance, and light plays beautifully across its surface. 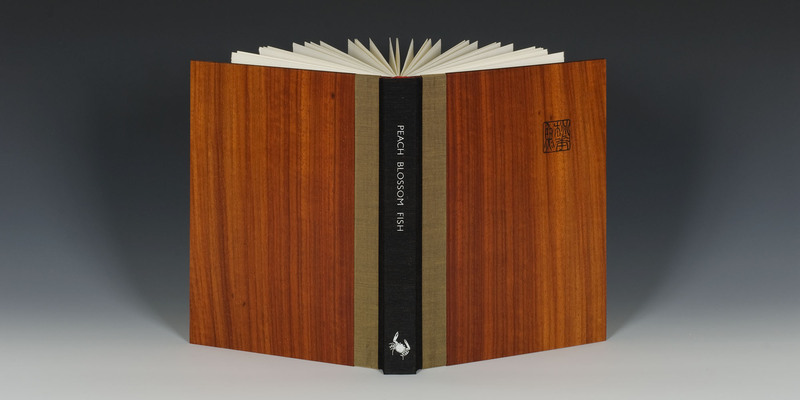 Thinking of the relationship of musical instruments and books, Ian Boyden, decided to use sapele to bind part of the edition of Peach Blossom Fish. The third wood he used is Alaskan yellow cedar. This is a tree that grows in the United States and has a very fragrant aroma. This was Ian's favorite wood to work with. This type of cedar can live for several hundred years, so when you pick up a copy of Peach Blossom Fish using this cover, you can run your hands over hundreds of years of tree rings. The life in a tree adopts the shape of book pages, thereby keeping the flame of wisdom burning in this world. Ian Boyden told me that to his knowledge, this is the first book to be bound with Alaskan yellow cedar. After this, for environmental reasons, he decided to stop using wood harvested from tropical hardwood forests, instead using woods from where he lives in Washington State such as such as maple. Every year, he buys a few logs from trees that are either cut down or that fall down in wind storms. He then cuts them into big slabs and has them stacked around his house. He has to season this wood for several years, so that it dries slowly and evenly. Only then can he cut the wood into thin slices and use them for the covers of his books. Amidst the duck weed (emerald) and algae (red). In a willow's thread-like branches. We plunge into the waves—into our profound dreams. Nor toil with fragrant bait in this silvery pool. And together cherish this flow of light. Listening to Ian Boyden talk about the production of Peach Blossom Fish is like reading a naturalistic prose poem. The sky is clear with a scattering of clouds; he is enamored with the natural. He absorbs nutrients from the soil, grass, and trees, and simultaneously gives them new life. He makes his own pigments, and he makes his own ink, paints by himself, and prints by himself. In order to get the ideal color of the painting required, he searches for meteorites, shark teeth, freshwater pearls, always seeking for something new. Ian Boyden is breathing calmly as the four seasons circulate. When I asked him how he selected the name Crab Quill Press, he said he wanted his press name to reflect animals that had access to water and air, realms not just of humans, and so he chose a crab and a feather to connote these other worlds. In addition in Chinese there is the expression “Crab Walking Script” which refers to Western languages that are written horizontally across the page, and in the west, the quill is the archetypal tool for writing. Ian Boyden submits to good fortune, as well as to his own spirit. His self-sufficiency and idyllic artistic activities makes me think of a quote from Walden: “An abode without birds is like a meat without seasoning.” And this makes me think of Feng Zikai's line, “A thatched hut buried deep in the green mountains, half an old pine and half myself,” and I think of Tao Yuanming, and I also think of Chang Ch'ung-ho. Chang Ch'ung-ho and Ian Boyden, one old and one young, one from the East and one from the West. Through Peach Blossom Fish, through this nostalgic book, this quiet book, they exchange their own thoughts regarding the world. Ian Boyden told me that each time he goes to Chang Ch'ung-ho's home that, in addition to calligraphy, she teaches him something new: how to make tea; how to trim a bonsai; how to appreciate old ink and seals. Once, they discussed bamboo for a few days. In Chang Ch'ung-ho's yard there is a small bamboo forest and in the middle of it there is a bench. Each time they would sit there, Chang Ch'ung-ho would look at her bamboo and wonder if any of it was encroaching on her neighbor's yard. If yes, they would cut the foliage back, so as not to disturb others. When the new shoots began to grow, Chang Ch'ung-ho taught Ian how to pluck the shoots, how to prepare and cook them. The aroma of new shoots filled Chang Ch'ung-ho's house, her house full of art. Ian Boyden said Chang Ch'ung-ho is a remarkable person, from the first time he met her he felt like he had known her for many years. Appreciate Chang Ch'ung-ho's calligraphy, for when you recognize its character, you will find there a whole person.